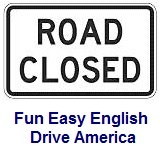 ﻿ Fun Easy English - Drive America - United States of America road signs, rules, and regulations warning, work. Warning road signs for the temporary traffic control of road work are used to advise road users of road maintenance or construction resulting in changing road conditions. Note: these signs are the same as the normal warning signs except the background color for temporary traffic control signs is orange instead of yellow. The regulatory road sign passing indicates when it is safe to pass slower moving vehicles. Warning road sign for passing indicates when passing is not allowed or is not safe. Warning road signs for the temporary traffic control of passing indicate when passing is not allowed or is not safe. Road work begins 1000 feet ahead. Road work begins 300 meters ahead. Road work continues for another 5 miles. Road work continues for another 8 kilometers. Usually attached to a work vehicle instructing road users to follow the truck through a construction zone. Traffic ahead is traveling at reduced speeds. The shoulder, or area adjacent to the road, is being repaired or maintained. The right shoulder, or area adjacent to the right side of the road, is closed. The right shoulder, or area adjacent to the right side of the road, is closed 1000 feet ahead. The right shoulder, or area adjacent to the right side of the road, is closed 300 meters ahead. Road machinery used to repair or maintain the road is ahead. Repair work or maintenance on the utilities is ahead. Use of explosives for road construction is ahead. The end of the use of explosives for road construction is ahead. Instructs road users to turn off their 2-way radios and cell phones which could interfere with blasting devices. Informs road users of the application of fresh oil on the road which could make the road slippery. Road is being repaired or maintained ahead. Flag person directly traffic is 500 feet ahead. Indicates the road condition is 150 meters ahead. Road is closed 1000 feet ahead. Road is closed 300 meters feet ahead. Right lane is closed 1/2 mile ahead. Right lane is closed 800 meters ahead. Two right lane are closed 1/2 mile ahead. Two right lane are closed 800 meters ahead. Road is reduced to one lane 1000 feet ahead. Road is reduced to one lane 300 meters ahead. Indicates that passing is not allowed or is not safe.